Syrup Mill --This syrup mill was located at my great grandpa's home in Third Ward of Vernon Parish, Louisiana. The process of making syrup by families has almost vanished. A trip to the grocery store supplies the family syrup but the items used to make syrup are being enveloped in our living in different ways. The syrup kettle...a treasured antique style of the past...is being used to enhance water and plant gardens. The names syrup kettle and sugar kettle are interchangeable. It depended on the locality whether syrup or sugar was made in the kettles or both at different times. All of our syrup kettles feature the timeless look of the past with a black textured finish. Made fully of fiberglass, these syrup kettles exude not only an unadorned beauty but possess quality far surpassing that of any of our competitors. 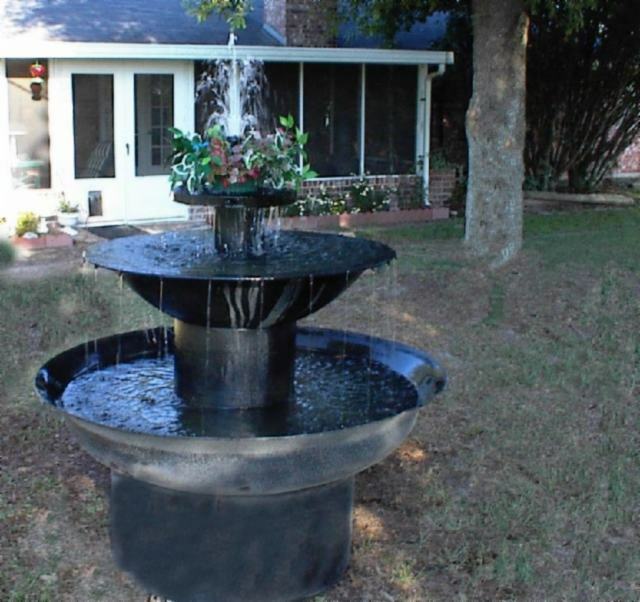 Our syrup kettles can serve not only as planters which will bring life to any gardening / landscaping project, but also, when coupled with accessories, can be transformed into a water fountain or waterfall which is not only relaxing to the eyes, but also to the ears. Our syrup kettles can also be used as a water garden, where water plants and goldfish can be used to create the aura of one's own private aquatic garden. All of our syrup kettles - sugar kettles are made in Louisiana, U.S.A.
add simplistic elegance in so many settings. 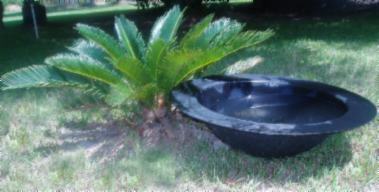 size makes it a perfect fit as well as a beautiful addition to any home or yard. Ivy Fiberglass Syrup Kettle - (48" diameter) This syrup kettle is a lovely accent for any setting. the exact desires of one who desires a hint of lavishness in a modest package. beauty is sure to make your home the most enticing in the neighborhood! water fountain, this kettle creates a vision that is sure to be unrivaled by any other. simple beauty that all of our syrup kettles offer. is transformed into an ideal water fountain or waterfall. Bookmark syrup kettles - sugar kettles - The internet is a big place. Use this bookmark to help you find us next time you are looking for syrup kettles or sugar kettles.